This is a great question. As you can tell by all that I shared this past month, it seems that all I really have time for is running the vacuum and washing the dishes. I certainly don’t have the time or energy to dedicate to decluttering. That is unless I am doing a series on it and find some inspiration. I think the easiest way to make a little impact without too much time invested is to pick a number – let’s say FIVE – and try to trash, put away or organize that many things. It might be five toys, five books, five pieces of paper on your desk, five shoes, five worn t-shirts, five throw pillows. Go around your house and just find five things in different categories that aren’t in their home and put them away. If needed, give them away. Or throw them away. Maybe do this every day for a week and see where it gets you. I would think that after a short while you will see a big impact with very little effort. PS – I hope you enjoyed this series, I know I got a lot of out of it for sure. Over the course of this past month, I’ve sorted through my closet, cleaned my junk drawer, am applying the 30 Day Method to my kitchen utensils, and cleared away a corner in my office that hasn’t seen the light of day in months. Thanks for coming along with me on this ride! What’s up next – stay tuned to tomorrow – I’ll announce our next 28 Days Series. Categories: 28 Days of Decluttering | Tags: 28 days, decluttering, pick a number, recycle, reducing clutter | Permalink. That’s my dog in there too. I feel like I’ve been over sharing all of my dirty secrets of my house and how much clutter is in it. And here I thought I was pretty neat and tidy and pretty well-organized. I’m not going to beat myself up about it. It happens. Life happens. And junk drawers, Tupperware drawers, kitchen utensils and more take a back seat to the other demands of our days. I hope you have gotten some benefit out of this series and tried your hand decluttering the space around you. I know, I have. And I’m inspired to do more of it! I’ll probably keep going even after our 28 Days. So for tip #26 – pick a corner. Or a table, or a counter and just get started. Order a pizza and put some tunes on and tackle that one section. Even just a little project and a little decluttering can make a huge difference in your outlook. The picture above is a corner in my office. In all honesty, it will probably take me less than an hour to sort through the stuff here and figure out a game plan for the items. Nothing in there is important and nothing is time sensitive. And probably because of that, I’ve forgotten about it – so much that I don’t really see it anymore. But it is still clutter. It needs to be handled and cleaned up. So my weekend project is to declutter this corner and get it clean it up. Stay tuned to Facebook and I’ll post a follow-up picture soon. Categories: 28 Days of Decluttering | Tags: 28 days, decluttering, reducing clutter | Permalink. I promise – all of these are clean, they just need to be hung up and put away. I don’t know why I do this. A few years ago, my New Year’s Resolution was to make sure all the clean clothes get put away. 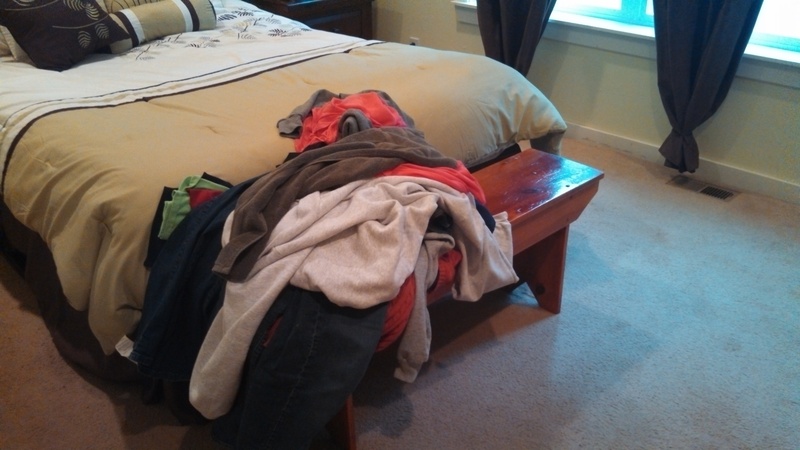 I am really good about putting my kids’ clothes away – or having them put them away. My husband is really good about putting his clean clothes away. Yet – I am the culprit here. Why do I do this? I have not a clue. OK – for the record, I do eventually put them all away. And typically, it is only my hanging clothes that don’t get hung up. Usually, I will hang everything up as I start the next round of laundry. In fact, right after I took this picture, I hung up everything in this pile. But why do I wait? I dumbfound myself. And it totally makes things look cluttered. It is hard to work around this giant pile of clothes. It probably drives my husband crazy, although he never says anything. How about you – how successful are you at putting your clean clothes away after laundry day? Categories: 28 Days of Decluttering | Tags: clean clothes, decluttering, put your clean clothes away, reducing clutter | Permalink. 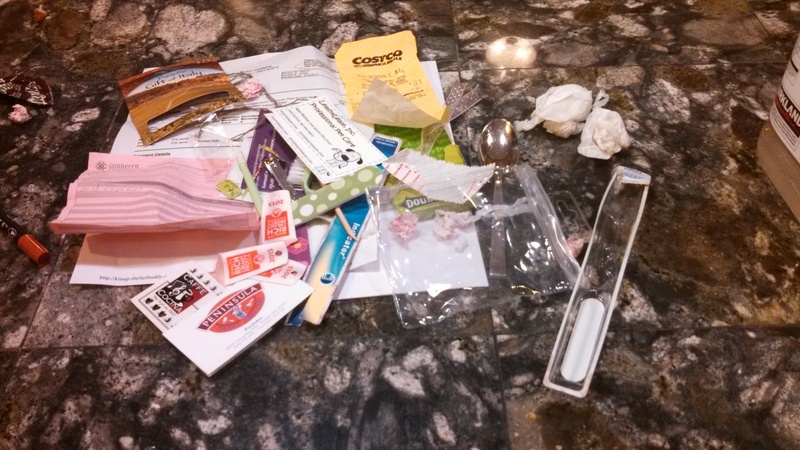 Tip #24 – Don’t let your purse become a trash can…. I feel a little bit like Ally Sheedy in the Breakfast Club when she dumps the contents of her purse for all to see. …like mine does. So, remember when I said I empty out the trash from my car every time I get out. Well, lately, I’ve been trying to avoid that step and I have found myself putting the trash in my purse instead. and some other stuff too that is now out on the curb waiting for trash pick-up tomorrow morning. UGH! I need to clean that out more often. How about you – post a picture of the contents of your purse for 10 extra points! Categories: 28 Days of Decluttering | Tags: ally sheedy, breakfast club, clean your purse, decluttering, purse, reducing clutter | Permalink. This seems like too much! I bet this person could reduce this stash to a third and still be able to clean their house respectfully. I think the 30 Day method would work great on the clean supply closet – don’t you? 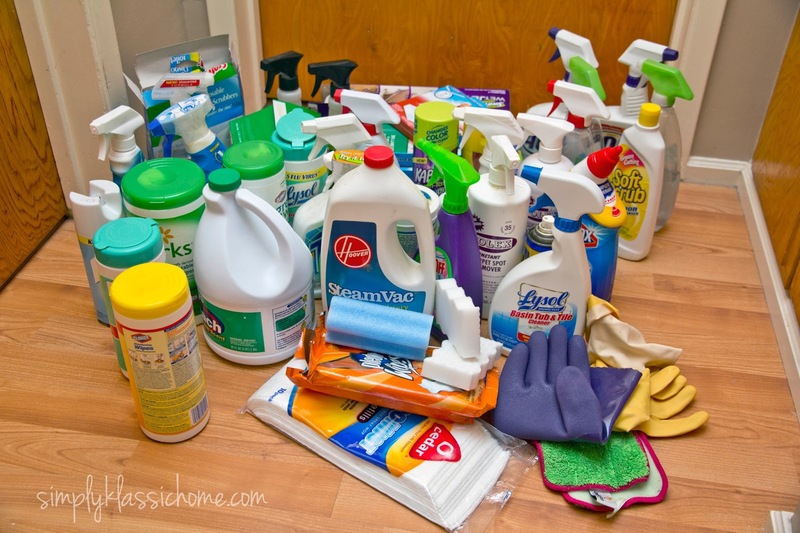 When you think about it – how many cleaning supplies do you really need? don’t forget a good supply (not over supply) of cleaning rags. What is your favorite cleaning supply? Do you have one or many? Share your thoughts below! Categories: 28 Days of Decluttering | Tags: 30 day method, cleaning supplies, clutter, decluttering | Permalink. 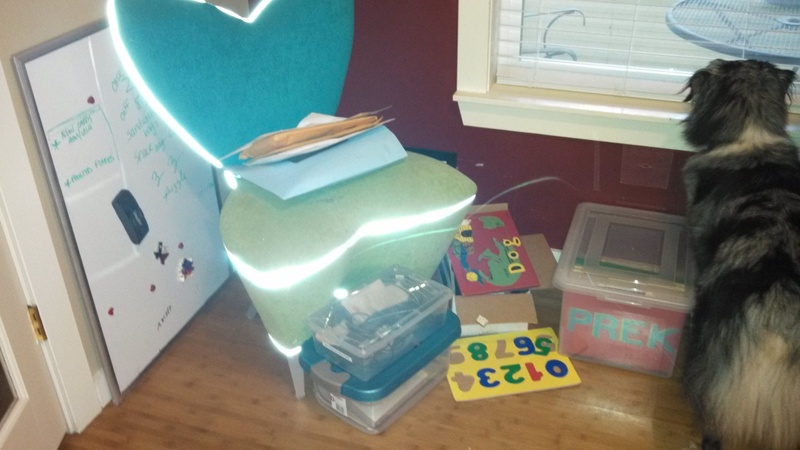 It’s starting to warm up and people (like us) are cleaning out their homes and spaces. Next up – sell all your stuff! I’ve never really gotten into garage-saling. I know it is a thing, and I know you can probably find some good deals out there. Honestly, I would rather go for a run or sleep-in on a Saturday morning than go driving around and go shopping through other people’s used items. This morning, my boys and I spent about two hours picking-up and cleaning our house. And the whole time I was thinking, we just don’t really need any more stuff. I don’t want to have to deal with or clean around anymore stuff! 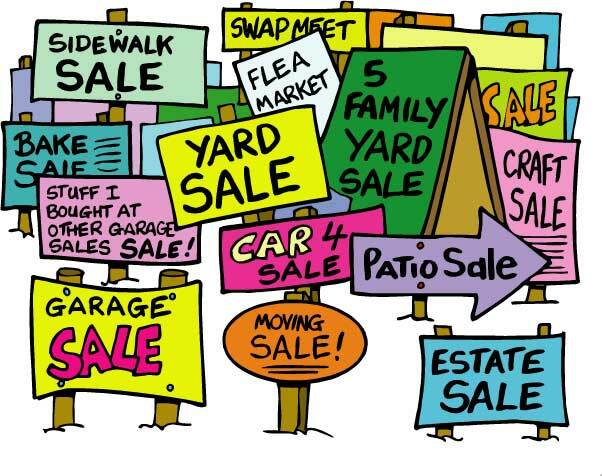 I think the best way to make the most out of garage sales is to have a plan or a wish list. But most importantly – stick to your plan. It is so easy to fall to temptation over the cute picture of the cat or another toy for your grandson. But if it isn’t on the list or part of the plan….ask yourslef – do you really want to pick it up later, clean around it later, eventually get rid of it later? Categories: 28 Days of Decluttering | Tags: avoid garage sales, decluttering, garage sales, reducing clutter | Permalink.